Product #3853 | SKU SM48S | 0.0 (no ratings yet) Thanks for your rating! 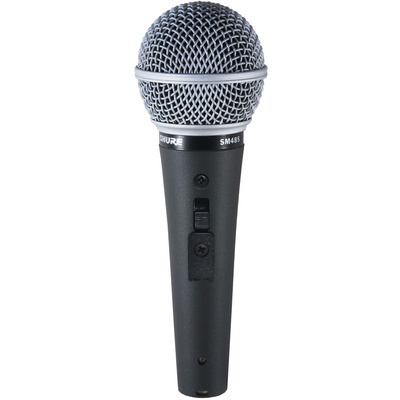 **Perfect for singers on the way up, the SM48 has many of the benefits of the SM58 at a very affordable price. Shure Models SM48 and SM48S unidirectional dynamic microphones are designed for professional sound reinforcement, studio recording, and broadcasting applications. They maintain a true cardioid pattern throughout their frequency range, ensuring high gain before feedback and rejection of off-axis sound. The tailored frequency response is ideal for vocals. A presence rise brightens mid-range performance, and a low frequency rolloff controls proximity effect. Both models include a shock mounted cartridge, a steel mesh grille, and an integral pop"filter. The SM48S also includes a lockable On/Off switch.